Block Which will display the current status of the realm selected. 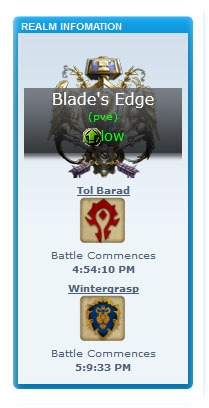 it will also display the current status of the two pvp zones aswell (Tol Barad & Wintergrasp) with information ranging from owner down to if the queue for battle is available. realm status image is provided from my domain at the moment as that side script is still a work in progress but it works as is currently. 2. navigate to Extensions -> Portal -> Portal Modules and click "Add Module" for the Left OR Right Column and add Realm Infomation. Ok, a couple of notes here for the Realm Status block. 1) When I first land on our Portal Page the block works. Upon Signing in, the images break. If I sign out, and reload page, the images and block seem to work correctly. I have had 3 members try and verify this finding on different systems utilizing different browsers, all with same results. I noticed that I can only specify one Realm per block, and that I can only have one status block active at a time. NOTE: There are some servers here that have up to 5 server merges. Additionally: there have been verified times when Undermine server will go down, but Anvilmar is still active, so I will switch servers and continue game play on and Alt toon. #1 provide a link to your forum and i'll create an account. also leave a link to the page where the errors are happening. #2 that is something that i'm working on currently and will be ready for the 2.1 release, i'm looking to add upto 5 realms into display with ACP options for each one. Ok...I have temporarily opened registration to the forum, be advised this si a sandbox on a small home server....be gentle. If you have any questions let me know, additionally, once you have registered, I welcome you to test your software at the sandbox site at any time. after looking at your test site i see that your missing some code edits that will really benefit your website. linking to app.php/portal breaks modules. if you read THIS post it will give you an idea on how to fix your issue. once the settings are applied the portal modules should work perfectly. Now that I have appropriately gouged my eyes out, here is what I have found. Go to ACP/Server settings by Enable URL Rewriting: set it to yes."" For my Sandbox build, this was a bit more complicated, and additionally so , by the fact that my actually home page is a wordpress page, and the PhPBB Forums is a sub page. an .htaccess file was not natively present in my pages build, so I had to make one into the same folder that housed the Config.php file and create a .htaccess file with appropriate code. In my Case, I simply downloaded the current PhPBB zip file and dragged a copy over to my personal server. I then added the Redirect to the bottom of the .htaccess file. I then went into my Sandbox server settings and again enabled URL settings. This was not enough for my home server (which is an ubuntu server. it all depends on the response from blizzards api. during weekly resets they also sometimes reset the api aswell and it can take a while for it to refresh infomration.